Situational awareness: Qualcomm and Apple have agreed to end their bitter legal dispute over patent royalties, with a deal that includes a 6-year agreement on royalty rates and a multiyear deal for Apple to supply chips to Qualcomm. Details. Notre Dame was 30 minutes from collapse last night, but today she stands, far more intact than we'd expected after yesterday's fearsome fire. 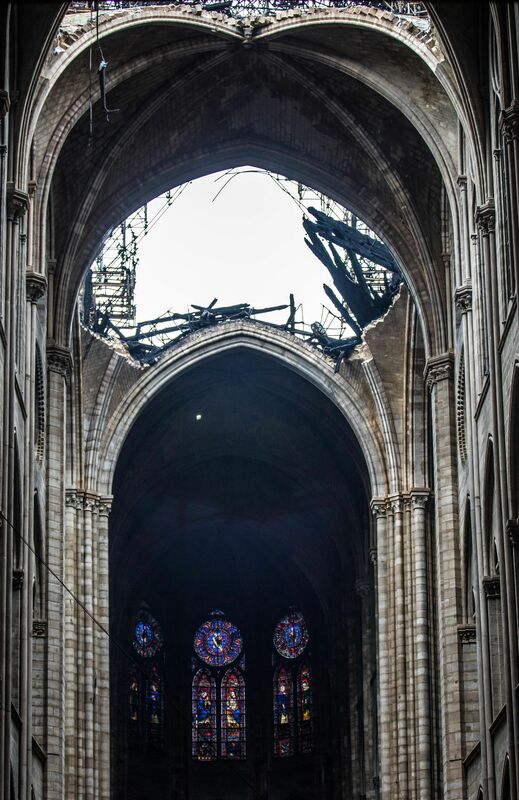 French President Emmanuel Macron: We will rebuild Notre Dame Cathedral within 5 years and "it will be more beautiful than before." There's already been $680 million pledged, including a few huge chunks from wealthy French families. Between the lines: "Experts say the combination of a structure that’s more than 850 years old, built with heavy timber construction and soaring open spaces, and lacking sophisticated fire-protection systems led to the quick rise of flames," the AP reports. 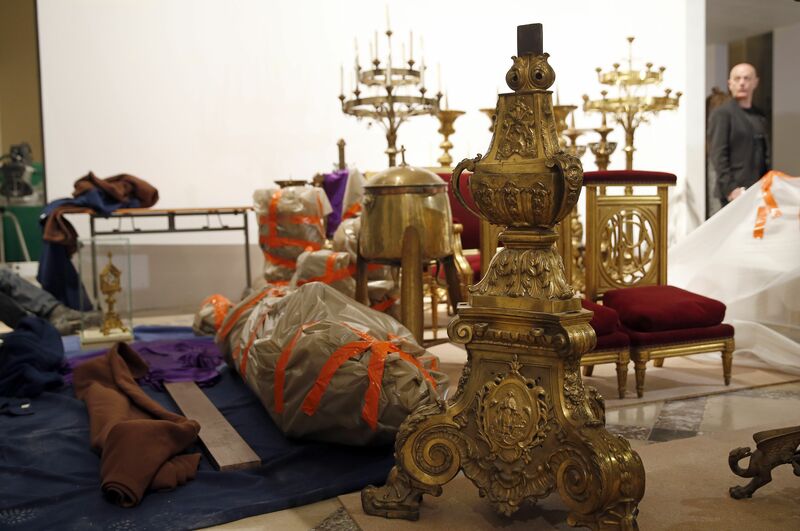 There'll be a tense wait to see if certain priceless artifacts survived the flames. Saved: The crown of thorns, the tunic of Saint Louis, the twin bell towers, the rose windows, the Great Organ, rooftop statues representing the 12 apostles and 4 evangelists. Lost: Notre Dame's wooden latticework roof called "The Forest," made of hundreds of oak beams cut from trees between 1160 and 1170, and the spire, built in the 19th century amid a renewed restoration effort. 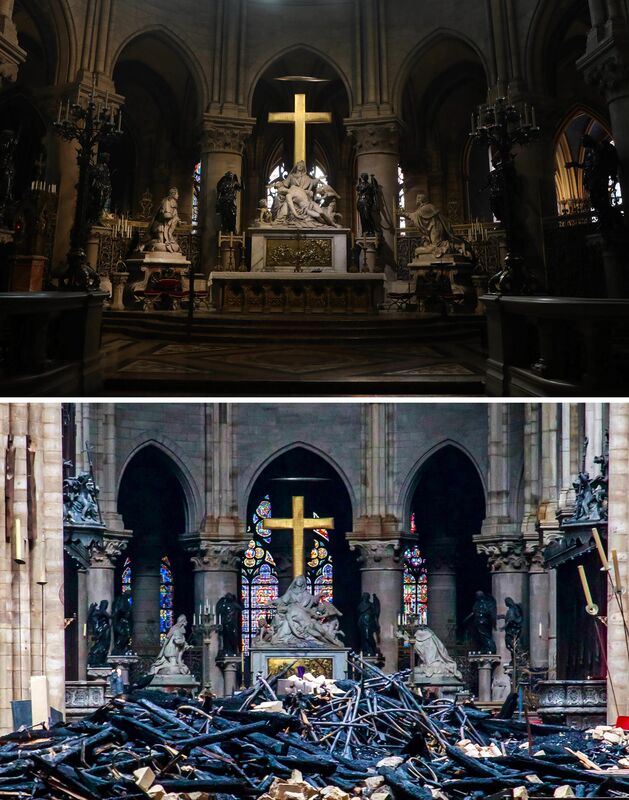 Unconfirmed: The Gallery of the Kings, which includes statues sculpted in the 13th century and later beheaded in 1793; relics of St. Denis and St. Genevieve, which were held in the spire; a nail believed to have been used in the crucifixion; a piece of wood believed to be a piece of the cross. The bottom line: "We're all just dumbfounded. It's more than miraculous, it's heroic,' vicar general Philippe Marsset said, per the AFP. Above: People attending mass at Notre Dame last year, and the same view today. 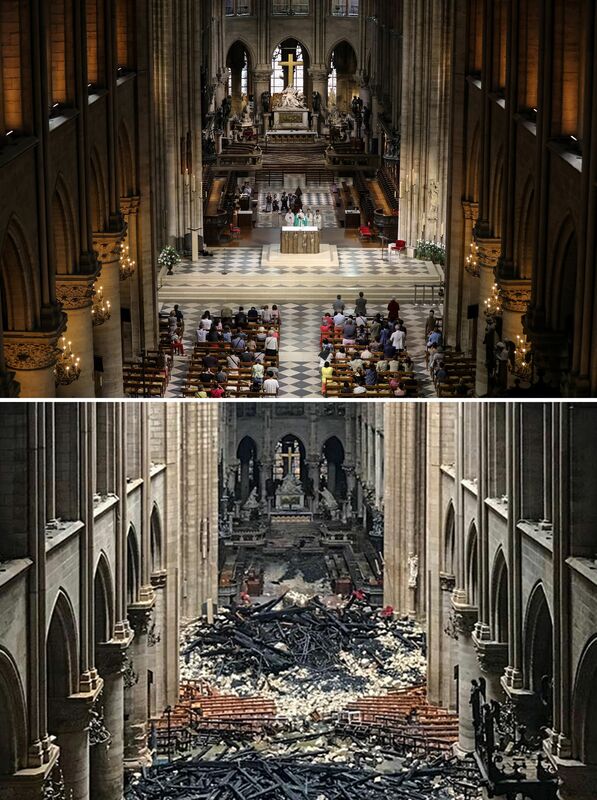 Below: The heart and transept at Notre Dame last year, and the same view today. In hopes of curbing the measles outbreak — which has infected 186 people in Rockland County, New York, — local officials have issued strict guidelines prohibiting anybody with measles from being in a public space for up to 21 days. Details. Jeff Bezos and Elon Musk's space age rivalry may not play out as a war of the rockets, but as a war for your internet. Go deeper. Uber CEO Dara Khosrowshahi stands to make a boatload of money if Uber maintains an average fully-diluted valuation of at least $120 billion during a period of 90 consecutive trading days. Go deeper. 16-year-old Swedish climate activist Greta Thunberg is criticizing the EU for holding multiple emergency summits on Brexit but "no emergency summit regarding the breakdown of the climate and environment." Details. 1 🎧 thing: Axios' Dan Primack talks with Amanda Nguyen, who at 24 years old was the driving force behind the federal Sexual Assault Survivor’s Bill of Rights. She just launched a Silicon Valley-style “accelerator” for ordinary people trying to get civil rights laws passed. Details. 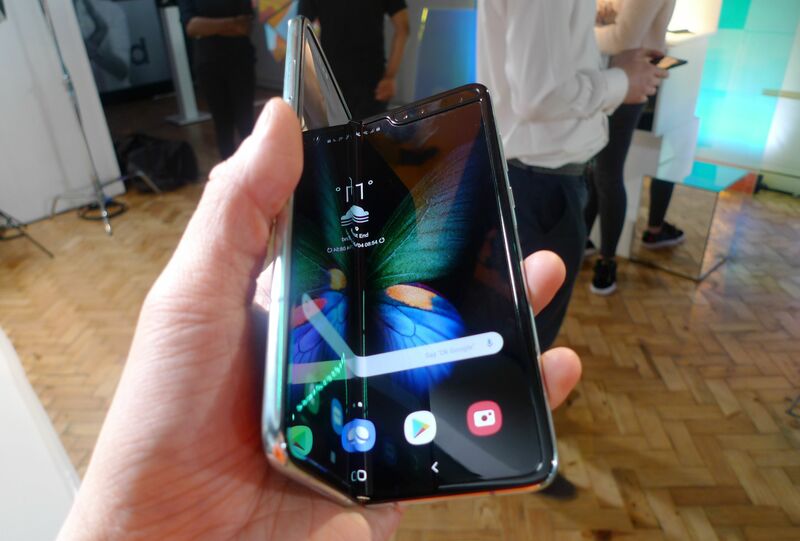 "Is [Samsung's] Galaxy Fold a gimmick to help sell more smartphones in a slowing market or a true breakthrough that will change how we use our devices?" asks the AP's Kelvin Chan. The state of play: "Samsung says the case for a folding phone has become clear: People want bigger screens but they also want a phone they can carry around in their pocket." The other side: "Skeptics might say that folding phones are a sign that the smartphone industry has run out of good ideas and fallen into an innovation malaise." 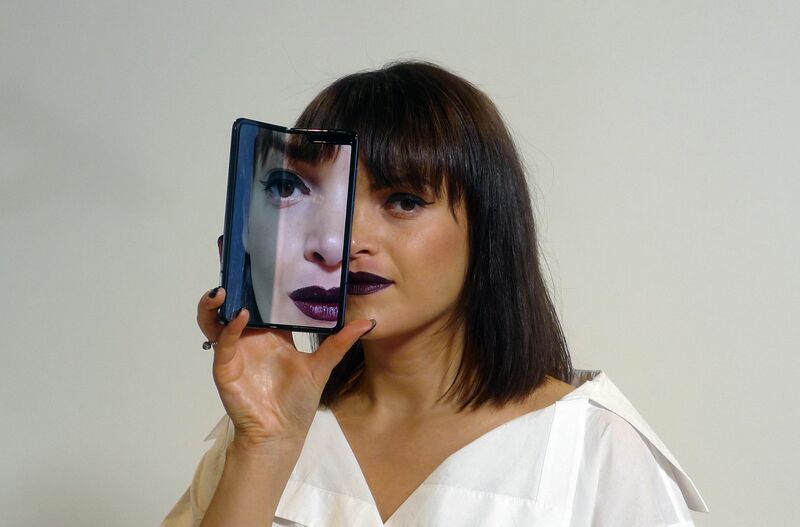 "Wide open, the Fold felt more like a small tablet than a smartphone, which suggests that one possible market is people who want both kinds of devices but don’t want to buy two." It's "set for release in the U.S. on April 26, priced at $1,980."